Back in October of 2009, I wrote a detailed article about a magical place named Fourtané Jewelers located in Carmel, California. 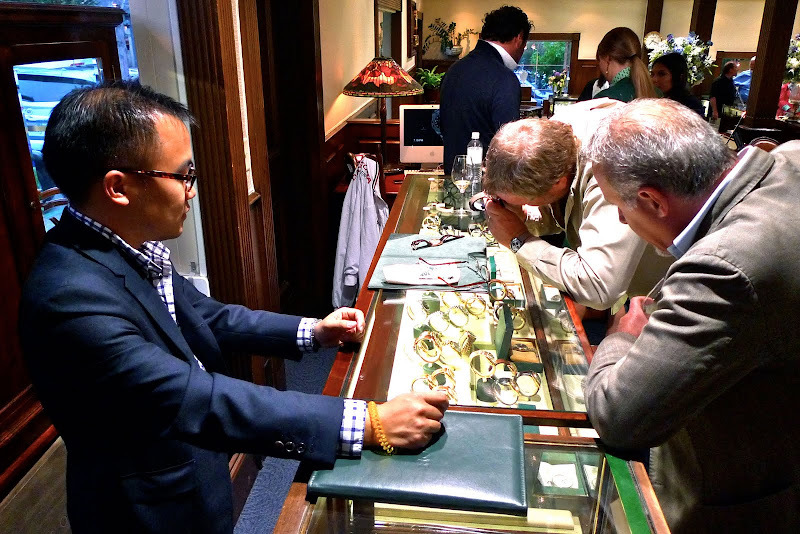 What makes Fourtané Jewelers magical? 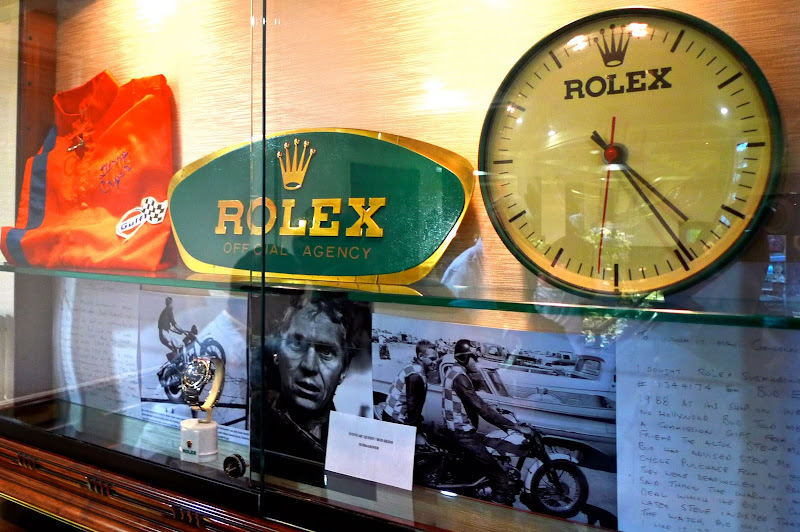 Visiting Fourtané is like visiting a Rolex Museum. 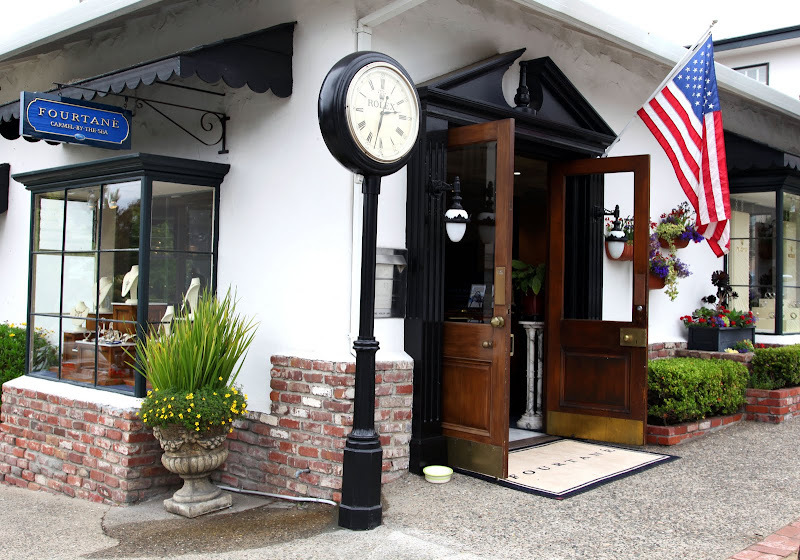 Fourtané Jewelers is located in the very quaint downtown area of Carmel, California, which is really beautiful. I send you some interesting photos taken in my last visit on August to this wonderful Rolex cave! That is Eric Ku behind the counter, wearing a blue blazer. 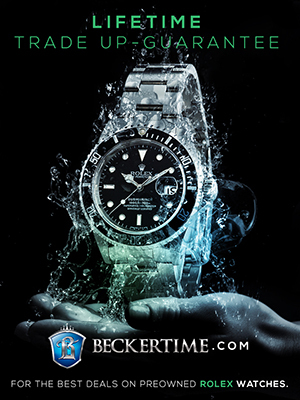 Eric is certainly one of the most knowledgable vintage Rolex collectors and dealers on Earth. 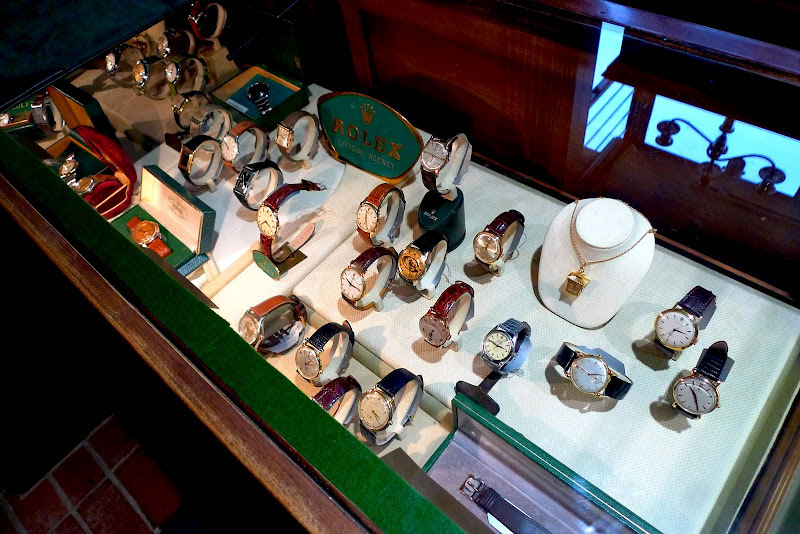 As you can see, on any given day, Fourtané is sugar-coated with an awe-inspiring collection of vintage Rolex watches. In the case below, we see a stunning collection of vintage Rolex Day-Dates with exotic colored dial that were popular in the 1970s and 1980s. Ronald Reagan is still the President of The United States, isn't he? 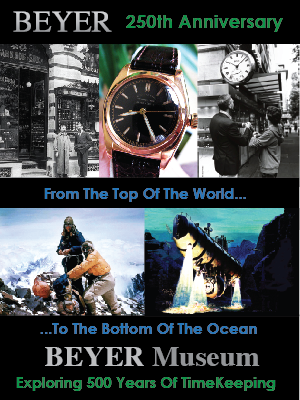 This next image shows the provenance documents for a Rolex Submariner that belonged to Steve McQueen. 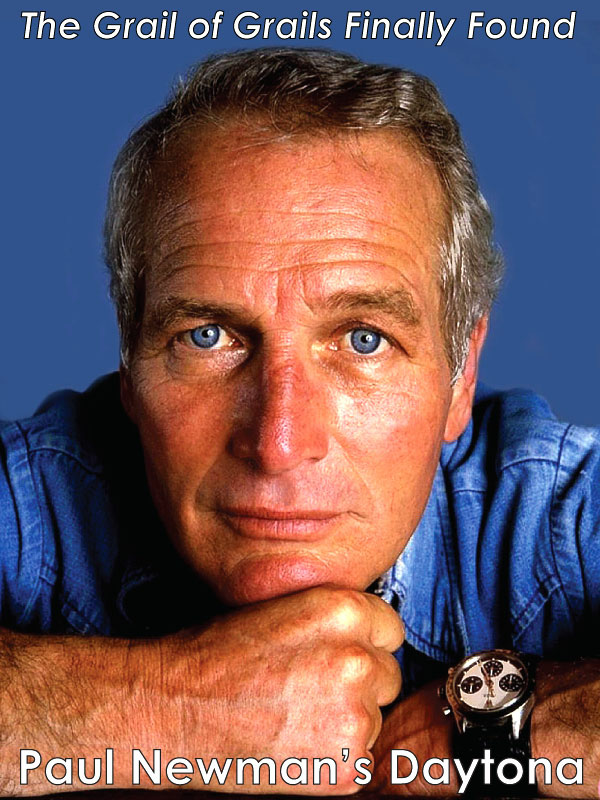 Where else on planet earth are you going to see a Rolex Submariner that belonged to Steve McQueen? At Fourtané you will! One of the things that makes Fourtané Jewelers unique is that the store environment feels like you are in a beautiful home, and the sales team are extremely knowledgeable and nice. They are so nice, you feel more like you are at home with close family and friends. 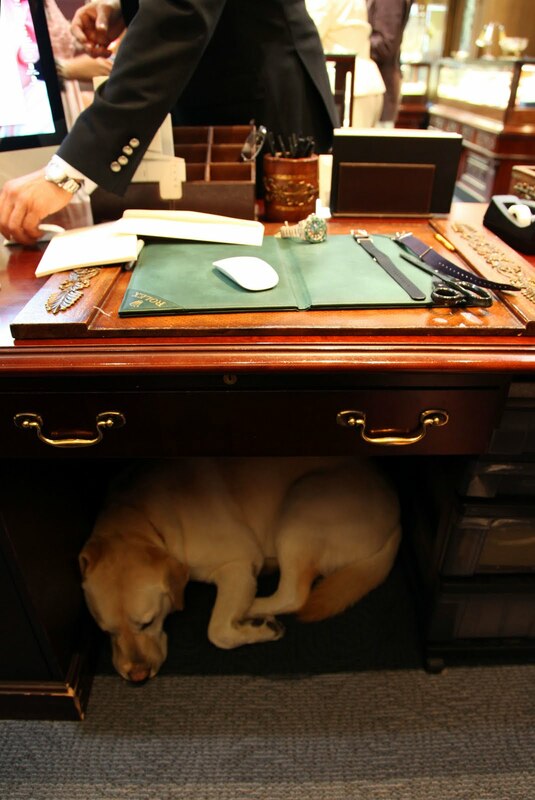 In the photo below we see the dog of an employee relaxing under a private desk. Pretty cute! On this recent trip I took to Fourtané Jewelers, I took a number of photos of beautiful historic Rolex watches, and I want to share them with you in chronological order. 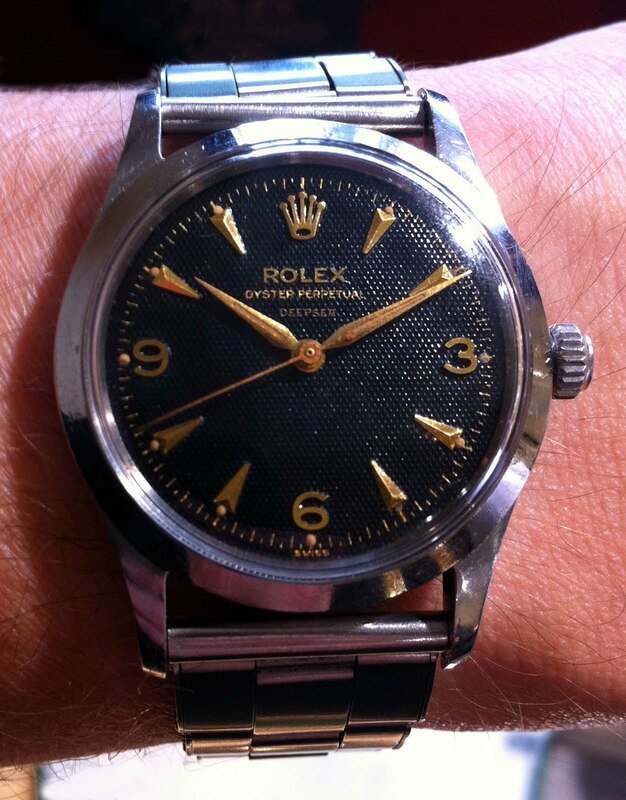 Let's start with this first Rolex which is a very early Rolex wrist watch. 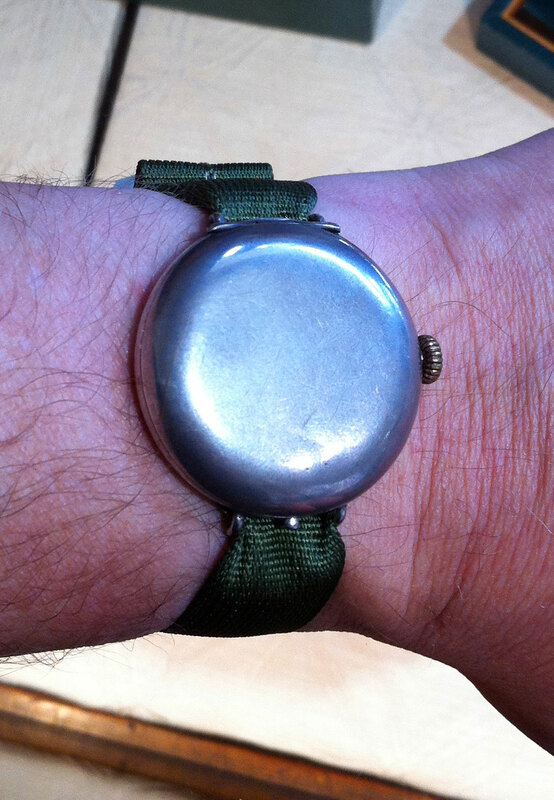 The wrist watch first really came into existence for men as a timing tool during World War I. 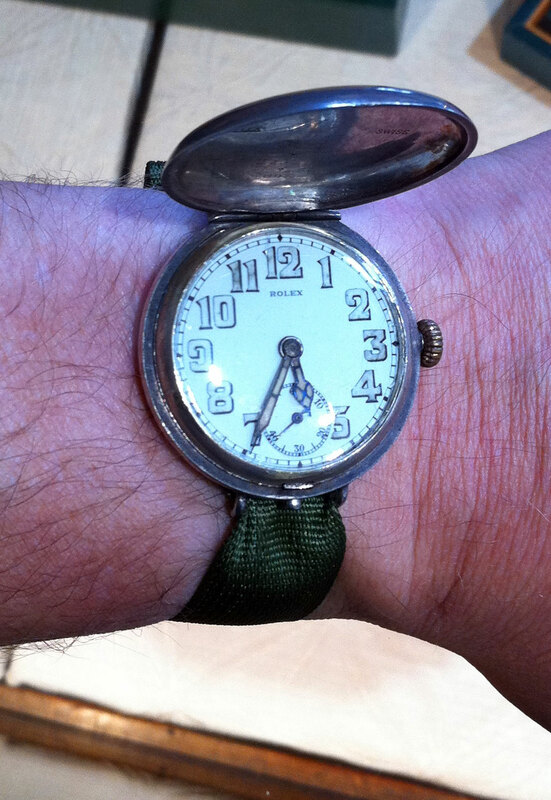 Essentially the first Rolex wrist watches were pocket watches that had fixed lugs welded onto the case, meaning the strap had to be sewn onto the lugs, or the wearer would have to use a slip-through strap like the one picture below. 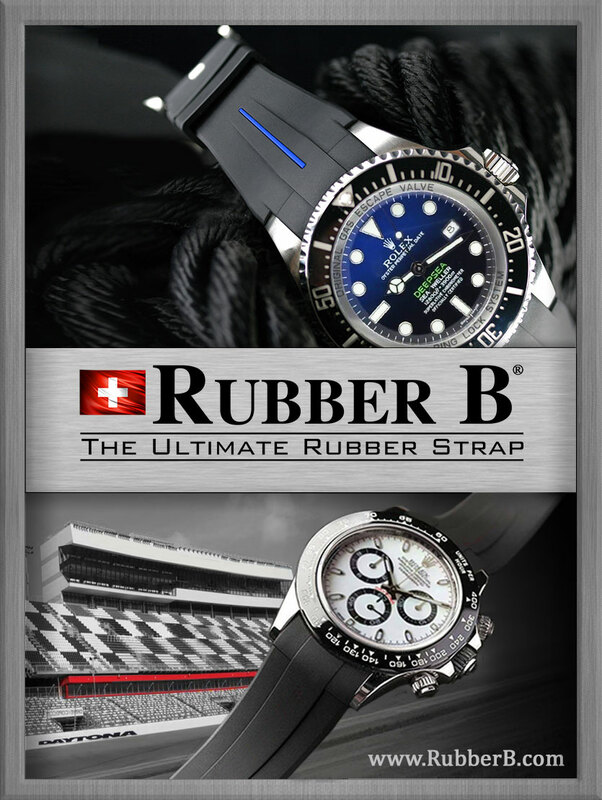 The watch pictured above has a "Snap-Front" case meaning the watch has a protective cover on the front that covers the entire front of the watch. 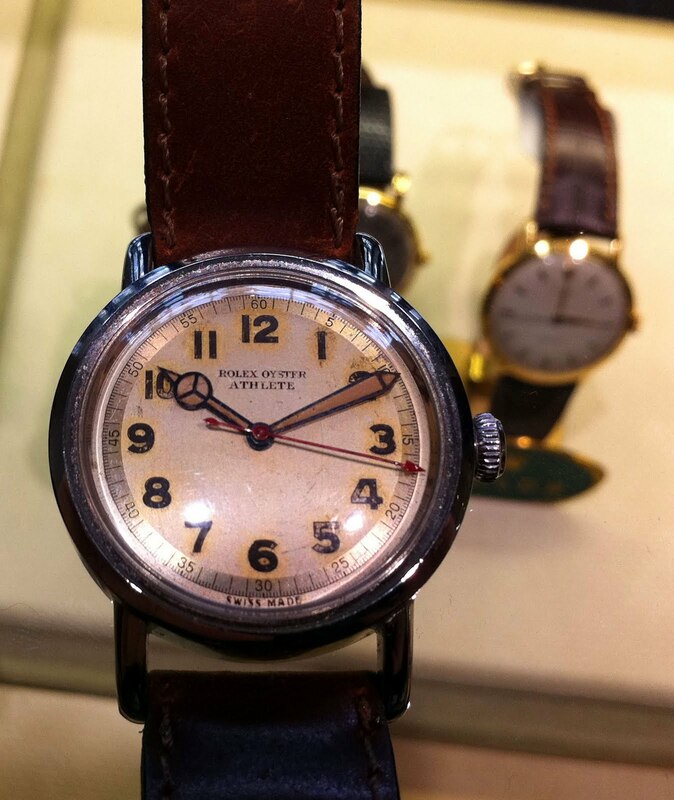 This watch was probably made around 1917. 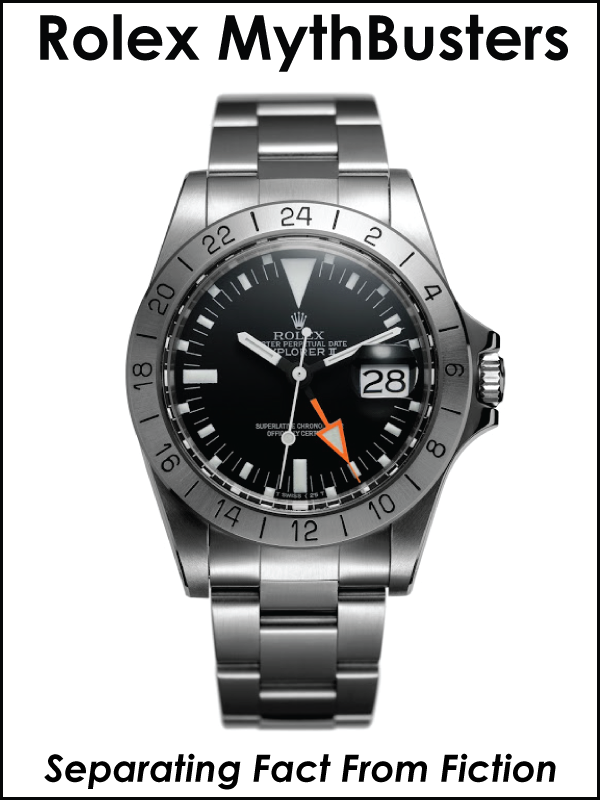 The photo below shows the same watch as in the photo above, but the snap-front is sitting in the open position. 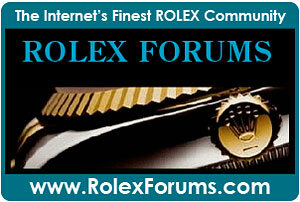 Next, in the picture below, we see a vintage Rolex Athlete model. 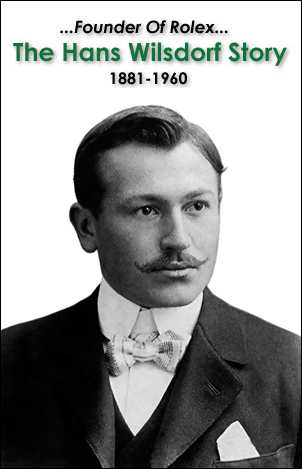 In the early years, Rolex had all kinds of interesting names like the Rolex Sky-Rocket. Interesting!!! 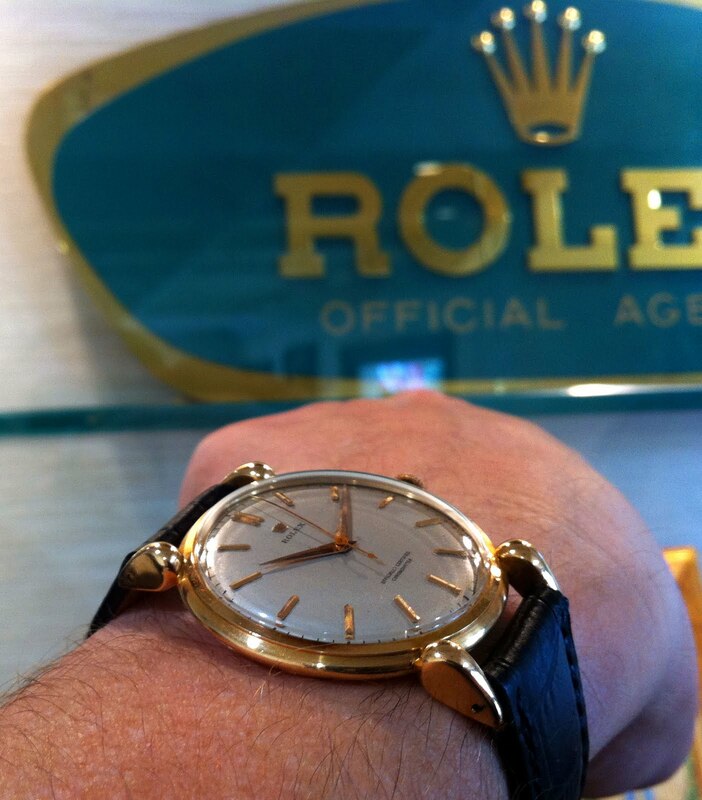 In this next photo we see a beautiful oversized Rolex Dress watch that looks great today. I think this model is probably from around 1955, and it has my favorite Dauphine hands. 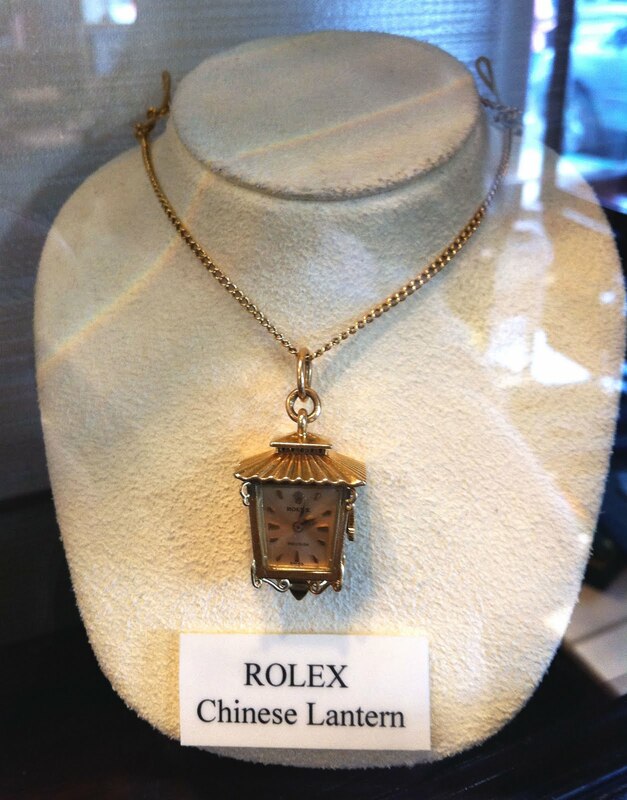 Next we see, a really unusual Rolex ladies Chinese Lantern pendant watch. 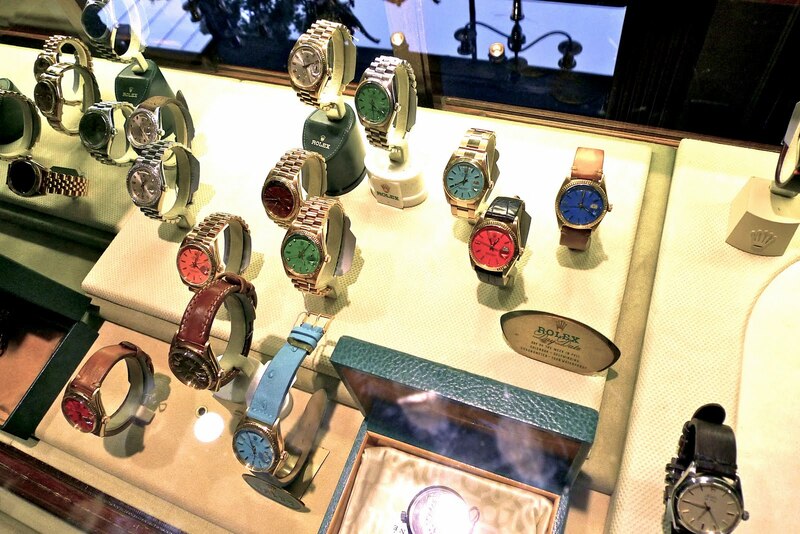 Rolex made so many different models throughout their amazing history. 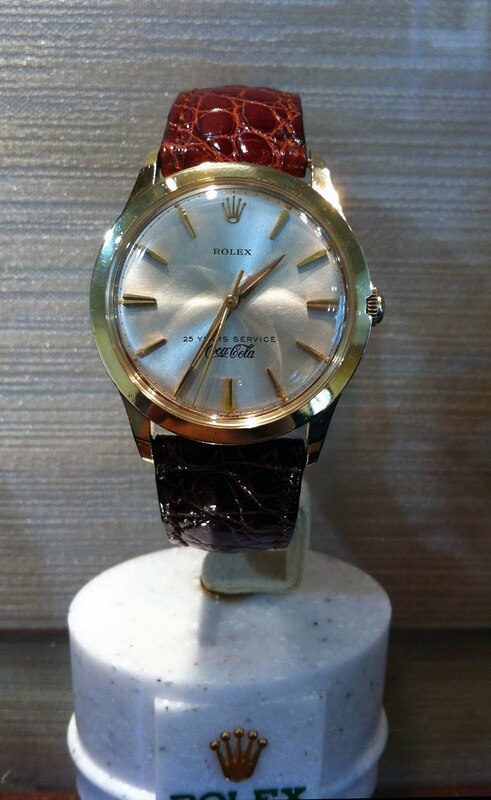 Next we see a Coca Cola Rolex that was given to a Coca Cola employee as a reward for 25 years of service. 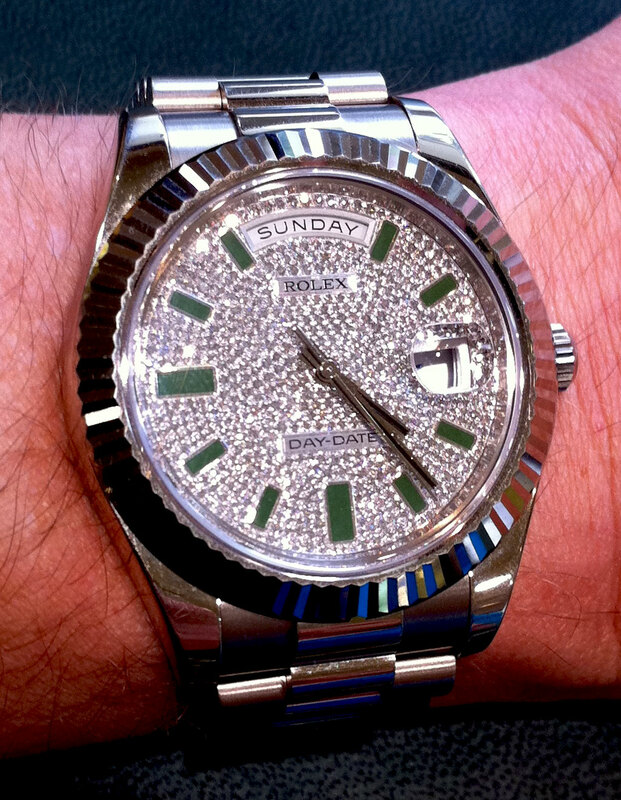 I imagine you could call this a Coke Rolex–like the Coke GMT? 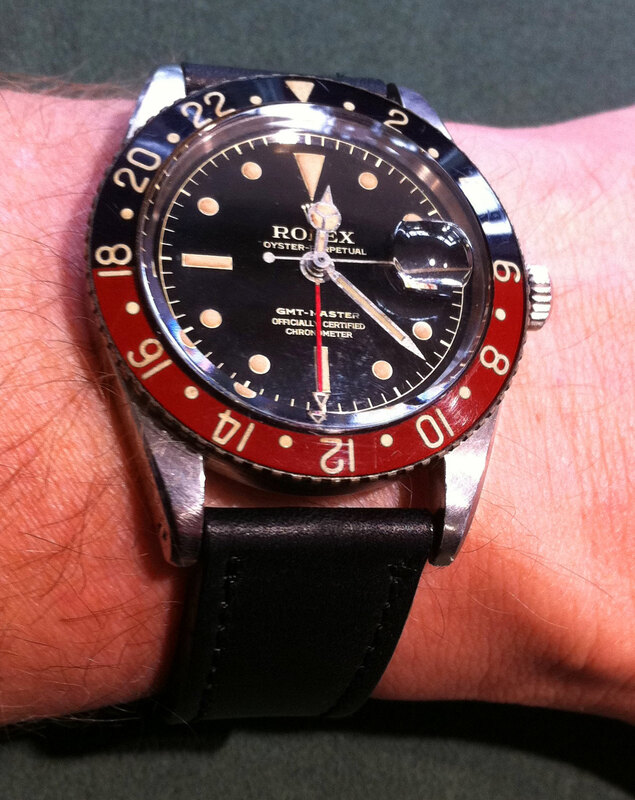 Speaking of a Coke GMT Master, this next photo is of the original first-generation Coke GMT with a Bakelite bezel. 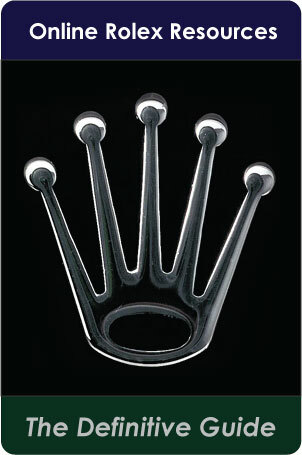 Notice it has no crown guards. 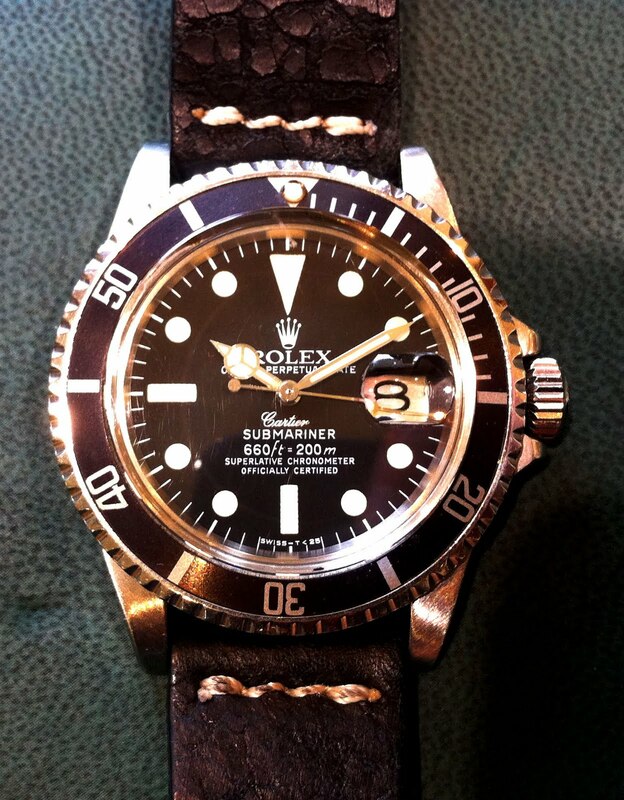 Next we see a very rare, unusual and fascinating first generation Rolex DEEP-SEA. Say What!?!? 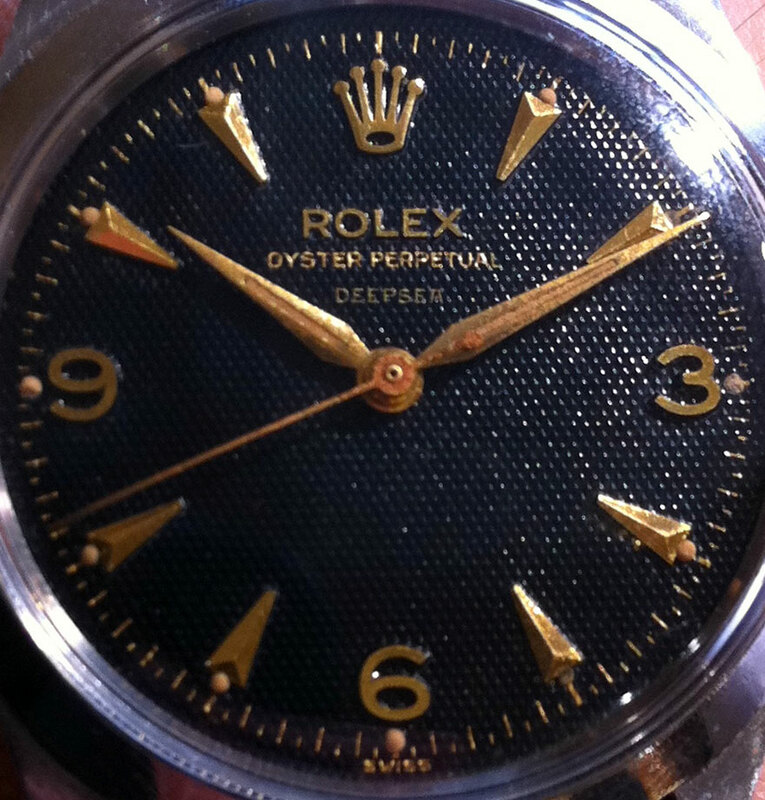 Rolex has an unusual habit of recycling old watch nomenclature, and the watch below is probably from the mid 1950s. This next photo is a close-up of the honeycomb dial from the first generation of the Rolex DEAP-SEA pictured above. 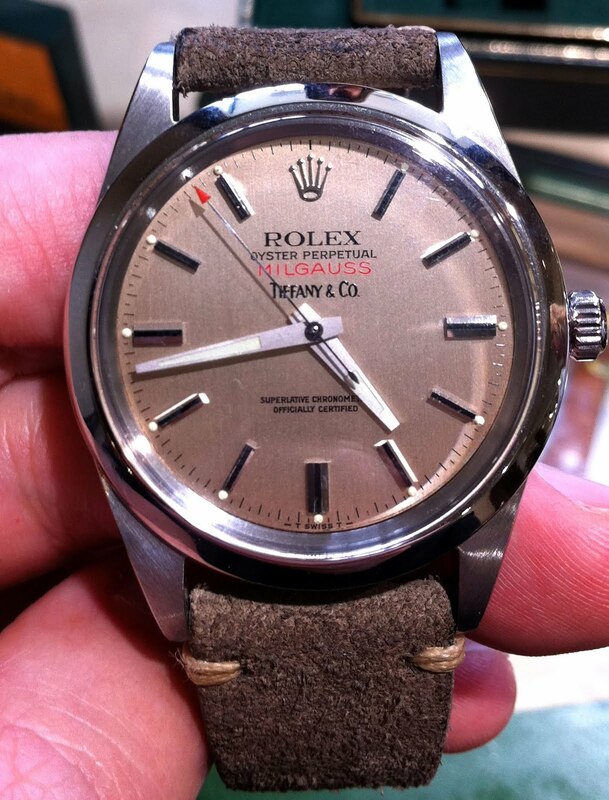 Next we see an original generation of the Rolex Milgauss, which is a real beauty. This example is very rare because it has a Tiffany & Co dial, which makes it very rare and valuable. 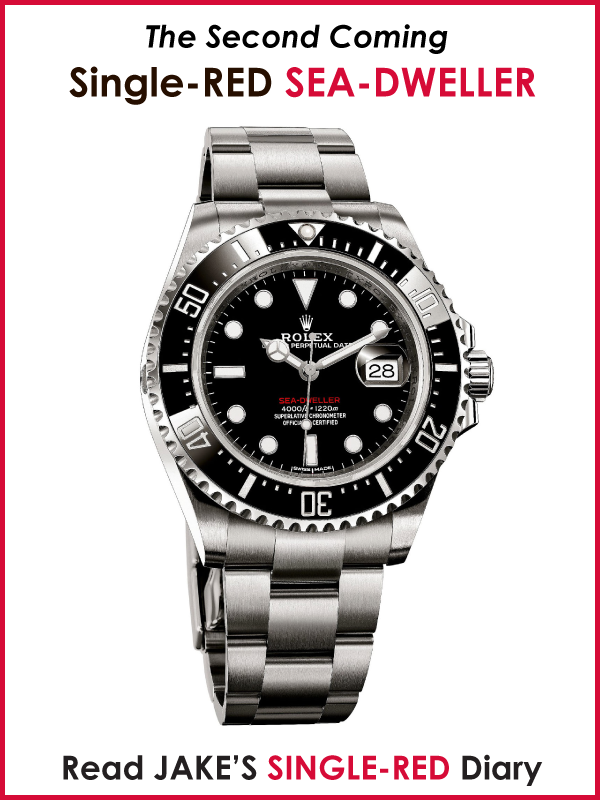 Next we see a Rolex Submariner [Reference 1670] with an extremely rare Cartier Dial that has a Cartier Dial designation. As standard version of this watch would probably be worth around $7,000, but since it has the extremely rare Cartier designation, it is worth around $150,000!!! 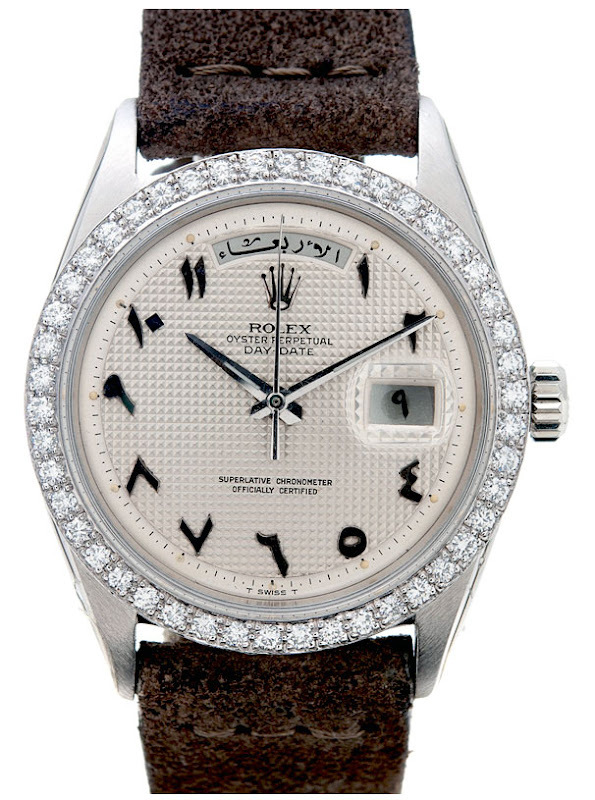 Next we see a photo of a vintage Day-Date with a true Arabic dial, that even has an Arabic Day and Date wheel. 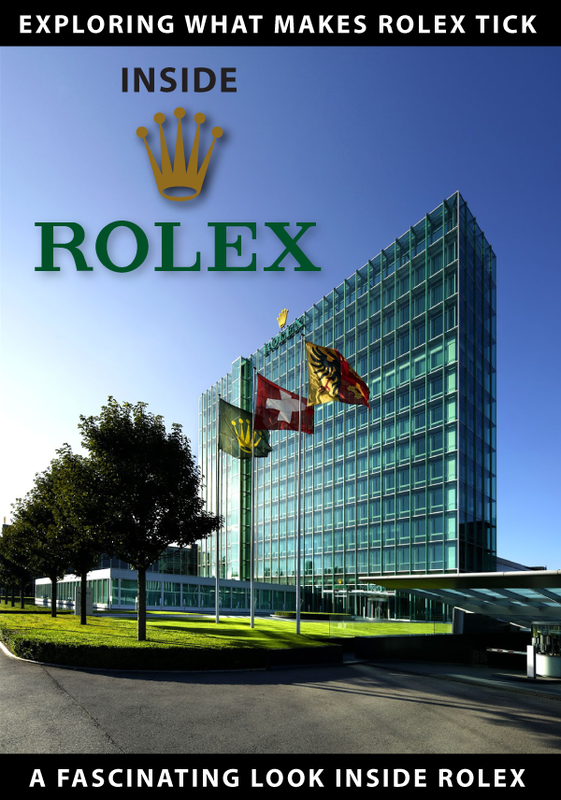 Fourtané Jewelers not only sells beautiful historical and vintage Rolex watches, but Fourtané Jewelers is also a Rolex Authorized dealer, so they not only offer all the current Rolex watches, but they also have some extremely rare Rolex watches you will likely never see in your life. When I was in Fourtané Jewelers a husband and wife were in the store who are loyal patrons. 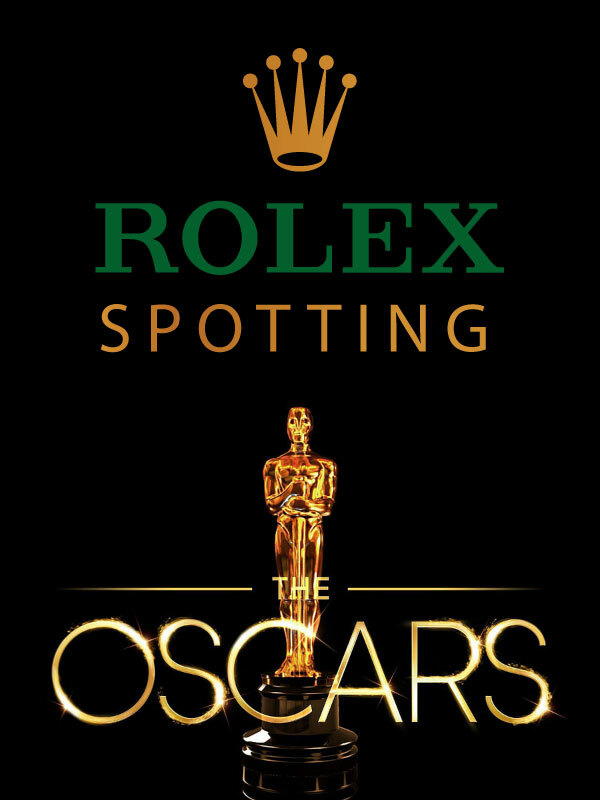 I noticed the gentleman was wearing a Rolex Day-Date II with a diamond and emerald covered dial I had never seen before. It turns out he bought it from Fourtané Jewelers. I highly recommend, if you ever get a chance to visit Carmel, California be sure to plan to spend some time in Fourtané Jewelers. 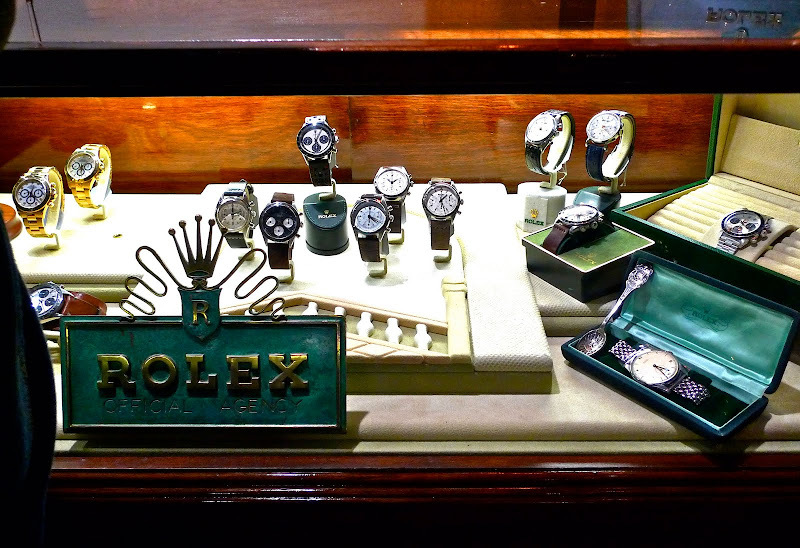 Fourtané Jewelers is likely the closest you will ever come to visiting Rolex paradise and a Rolex Museum, except everything is available for purchase.